What sort of image is it? Describe how the colours and composition work to make this image appeal to you. I must admit, choosing just one image at the National Gallery was a daunting task, although one that I looked forward to. Their collection of original masterpieces is truly awe inspiring. After admiring several galleries, I found myself in the European Masters (16th-17th century) gallery, and after bypassing several groups of inquisitive school children, I entered the portrait gallery and found myself drawn to a stark image in the corner. After examining the paintings closest to the door, images portraying not only the culmination of years of skill building on the part of the artist, but also flaunting the wealth and prestige of the subject, I could resist no longer. I had to find out more about this dark, bearded figure, so at odds with the rest of the gallery. “Monk with a book” read the title plate. Really?? I had been drawn in by a religious image?? Me? the most anti religion (but pro faith) person in the entire building? Now I had to know more. Even more fascinating, the portrait was by Titian, an artist that I had studied for a small time in high school, so many years ago. 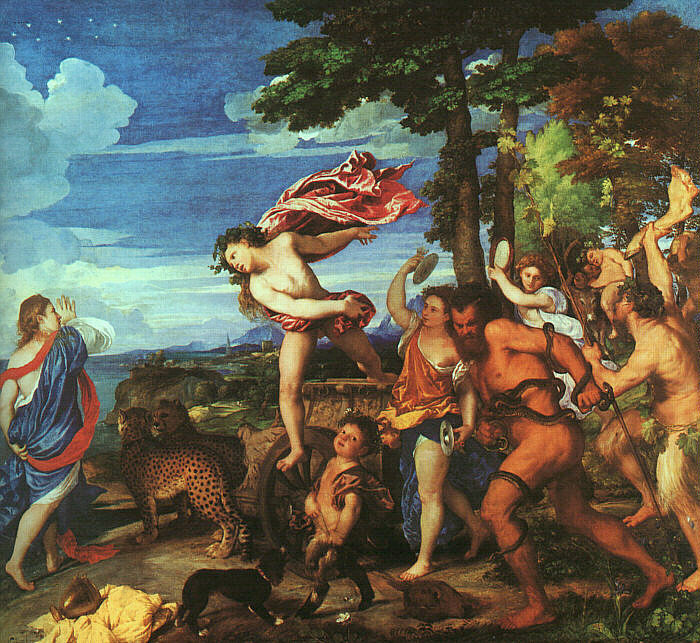 That couldn’t be right, the Titian I studied was denoted by his rich use of colour, his complex backgrounds, attention to detail, particularly in clothing. I recall to my memory my favourite painting from all those years ago… Bacchus and Ariadne. The rich colours of silk, the drape and reflection, the details and complexity of the depth in the background so at odds with this image I was looking at. By contrast, the portrait I am drawn to lacks subtle detail in the clothing, the background is primarily tones of a single colour, with subtle highlights, very stark and quite drear. As for composition, it consists of a monk, holding a book onto a table, centred and surrounded by, well, nothing. The traditionally garbed monk (who remains anonymous) simply pops out of the frame with his intense, brooding eyes and heavy beard, quite unlike the fashion of the day. Apart from the book leant on a stand by the monk’s hand, this is a very bare portrait, not even a crucifix in the background, and indeed, the book isn’t even identifiable as a bible. I read on avidly. Painted in 1550, this late renaissance portrait first came to light in Australia in 1924, and was immediately accepted as genuine, although it has survived two separate challenges to it’s authenticity. The National Gallery has worked hard to restore the image to it’s original intention, despite previous cleaning attempts leaving the book, in particular, quite damaged. I admire the work done to the book, which is, apart from the monk’s fingernails (how interesting!) and his beard, one of the few detailed parts of the portrait. The rest of the information plates adds nothing to my knowledge. I find myself wondering what the monk is looking at. Unlike every other portrait in the gallery, he is NOT engaging with the artist or the viewer at all, his intense gaze isn’t looking out at the light source to his left either, but is fixed on a point to his right, and his expression is somewhat short of calm. I feel quite discomfited by the concentration displayed in his gaze. 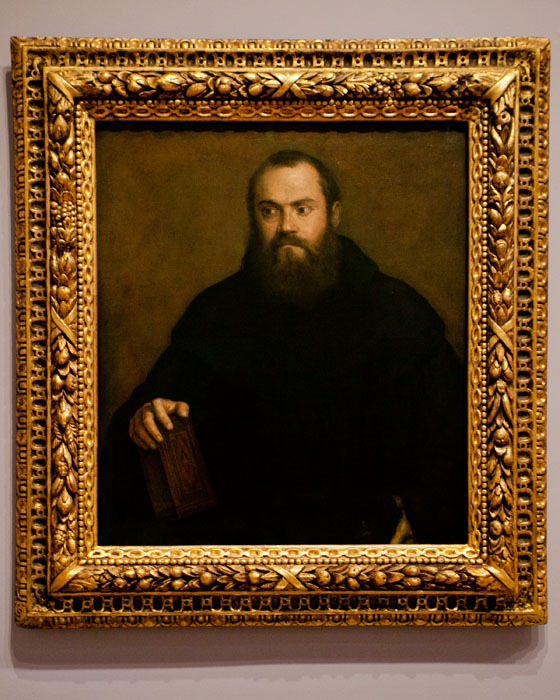 It’s not hard to see why Titian chose him as a subject. I walk back to the doorway and look at the portrait again, truly, his gaze is directed into a corner, so it’s not that which drew me in. The frame, while attractive, is not overly ostentatious compared to the remainder of the gallery. Finally, it clicks. Its the LACK of colour range, the lack of ornamentation, and the total disinterest on the part of the monk, he doesn’t care whether I come in to peer at him or not, he has nothing to prove to me .. his interest is somewhere distant and un named, impossible for me to reach. Perhaps, just like heaven itself. Slightly shaken by this revelation, I look around and realise this gallery has over half a dozen people in it. People that were not there when I entered. I had been so drawn in to the monk’s solitude, that I didn’t recognise myself becoming no longer alone. The more I stare, the stronger the feeling of solitude becomes, indeed, it is almost loneliness when I finally am drawn from my reverie by a group of schoolchildren and their tour guide, come to learn about the portrait of Lucrezia Borgia that sits opposite. I reluctantly leave the monk to his thoughts and comtemplation, still feeling just a little sombre and solitary. Walking out of the gallery into the daylight comes as a bit of a shock and I find myself disoriented and sit for a few minutes collecting my thoughts and thinking over the effect this image has had on me before heading off. Middle aged with freckles, the rest is subject to change without notice. This entry was posted in Uncategorized and tagged Ariadne, Bacchus & Ariadne, Light, Lucrezia Borgia, Monk, National Gallery, National Gallery of Victoria, Titian. Bookmark the permalink.